A name that is already a program, as if to say that form is not the main objective of design but the result of a design process. 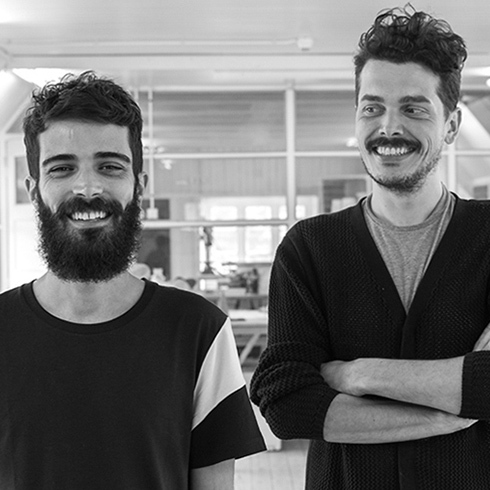 The Formafantasma Studio is based in Amsterdam where its founders Simone Farresin (1980) and Andrea Trimarchi (1983) settled after attending the Eindhoven Design Academy. Their appearance on the international scene dates back to 2010, when they were noted with the installation Autharchy at the Rossana Orlandi space during the Fuorisalone. A collection of objects - vases, bowls, plates - produced with flour, organic waste and limestone, whose meaning was to be found in the alternative mode of production, totally sustainable and autonomous, in homage to simplicity and daily life. With a critical approach to the theme of sustainability, the work of the studio investigates and experiments the materials and the relationships between local cultures and traditions covering the role of bridge between craftsmanship, industry, object and user. Their works have already been exhibited in museums such as the MoMa the Victoria and Albert, the Metropolitan of New York, the Chicago Art Institute, the TextielMuseum of Tilburg, the Stedelijk's-Hertogenbosch, the MUDAC Lausanne, the Mint Museum of Craft and Design in the North Carolina and the MAK Museum in Vienna.